The temple of Artemis, also called Artemision, is a sacred building of the Hellenic period built on the remains of older temples. It is located in Selçuk, Turkey, near the Aegean Sea, in a territory once dominated by the Greek Empire. This building has been placed on the list of the seven wonders of the World by virtue of its size and its decorations. This document explains how it was built, as well as its building materials. 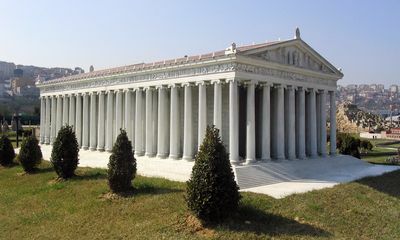 Only two different materials were used on the temple of Artemis, both on the archaic temple and on the Hellenic: marble and wood. The marble was an innovative material, it was little used. It must be said that it had several disadvantages for the time: It was heavy, rare and little workable by hand. The fact that it was heavy posed enormous transport problems because the quarries were far from the construction site. The means of transport of the marble did not yet exist in the 6th century BC, and it was therefore difficult to obtain them. 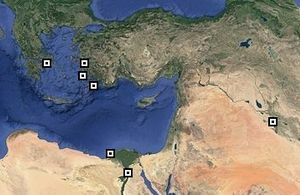 Moreover, there were few quarries in Asia Minor or in Greece, so it was necessary to bring it from afar. Finally the marble is a hard material, therefore solid for construction but difficult to work. Now, in this remote period, the techniques of construction were quite basic, hence a great difficulty in the use of this stone. But then, why use it? The answer is simple: Precisely because it is rare, marble was considered a precious material, so that was appropriate to build a temple to Artemis. Moreover, there was a political notion behind it: The city of Samos, which had built a temple shortly before, did not use it, by using it in Ephesus the inhabitants stood over their rivals in terms of architectural achievement, and that was an important point. Finally, and it is a contingency contest, it seems that a quarry was discovered near Ephesus shortly before the beginning of the construction. A stroke of luck that allowed the manufacturers to use this material when it was not originally planned. Note that marble remained a rare material for construction in antiquity, very few buildings used it. Even if a quarry had been found near Ephesus, the problem of block transport of several tons arose. How to transport columns or architraves so heavy on site? The answer existed since prehistory: Using the wheel. The sections of columns were simply rolled to the ground, pulled by oxen. The blocks of stone were pierced at their ends by two holes in which an axle was passed, an axle on which were fixed large wooden wheels. All that remained was to harness the oxen to advance. This technique, if time consuming, was still very effective, it was used many times throughout the Greek and then Roman empire. As for the wood, we must trust Pliny, a Roman author who lived from the year 23 to the year 79 AD. In these accounts he writes that the parts of the wooden temple were very worked. He mentions the use of ebony, cypress and cedar, used because they are petrol able to last. The cedar was used for the framework, it was cut into solid beams. The cypress was used to make the monumental gates that gave access to the naos, the central part of the temple. Unfortunately it is not known whether he speaks of the archaic temple (from the 6th century BC) or the Hellenistic temple (4th century BC). The ebony would have been used for the doors of the temple. They were supposed to be watered permanently of "nard", a very precious perfumed oil that was used for the sacred unctions. The main difficulty of the construction was the digging of the foundations. It must be said that the temple was built in an area close to the vaguely marshy river, and the soil was therefore reluctant to bear the weight of such a monument. Although smaller, the previous monuments had already proved that it was difficult to build at this place. The builders had therefore much to do to achieve their ends. According to Pliny the Elder, the architect of the temple of Croesus Theodoros of Samos found the solution. He had the idea of ​​installing a substrate made of a mixture of sand and coal on a bed of animal skins. This substrate made it possible to fix the ground to make the foundations. This technique seems to have actually been used since the archaeologists actually extracted from the soil remnants of carboniferous elements and various fragments of organic origin. On these foundations was laid a layer of shale caught in the clay, then a slab of plates of polygonal marbles forming the ground. On the basis of recent estimates, the weight of each column should be around 100 tonnes. Such a mass had to be hoisted to 20m of height and perfectly adjusted. How was it done, knowing that the techniques were not worth the ones used in the following centuries? It remains a mystery, but science advancing every day, one can hope to have the answer in the future.